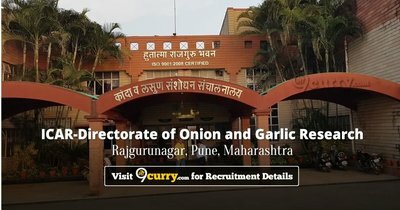 DOGR Pune Recruitment 2019: Directorate of Onion and Garlic Research, Pune / www.dogr.res.in is conducting recruitment processes to fill 5 vacancies. As of now, there is one recruitment drive going on for Walk in for SRF, YP II Posts. DOGR Pune Recruitment 2019 - Walk in for SRF, YP II Posts in DOGR Pune, Pune, Maharashtra on Temporary Basis. Candidates are invited by Directorate of Onion and Garlic Research, Pune to attend walk-in-interview to be held on 27 Apr 2019 at 10:30 AM for 5 vacancies. DOGR Pune Recruitment 2019 - Walk in for SRF, YP-I & YP-II Posts in DOGR Pune, Pune, Maharashtra on Temporary Basis. Candidates are invited by Directorate of Onion and Garlic Research, Pune to attend walk-in-interview to be held on 19 Mar 2019 10:30 AM for 4 vacancies. DOGR Pune Recruitment 2018 - Walk in for Young Professional Posts in DOGR Pune, Maharashtra on Temporary on Co-terminus Basis. Candidates are invited by Directorate of Onion and Garlic Research, Pune to attend walk-in-interview to be held on 05 Feb 2019 10:30 AM for 2 vacancies. DOGR Pune Recruitment 2018 - Walk in for YP II Posts in DOGR Pune, Maharashtra on a Temporary Basis. Candidates are invited by Directorate of Onion and Garlic Research, Pune to attend walk-in-interview to be held on 12 Dec 2018 from 10:30 AM for 3 vacancies. DOGR Pune Recruitment 2018 - Walk in for YP II Posts on a project entitled "AINRPOG and Main Project" in DOGR Pune, Pune, Maharashtra on Temporary on Co-terminus Basis. Candidates are invited by Directorate of Onion and Garlic Research, Pune to attend walk-in-interview to be held on 06 Oct 2018 10:30 AM for 2 vacancies.